53 percent of cyber attacks caused financial damages of at least 500,000 U.S. dollars and is expected to continue in the coming year. Hackers implement various hacking techniques (including malware, phishing, cross-site scripting) to peep into your network and fetch the confidential information out of it. So, whether you are an ordinary user or a website owner, it is quite essential that you know the common type of cyber attack and the ways outs to stay safe from it. Here’s a quick overview of the most common types of cybersecurity attacks which resist in the website industry. A phishing attack is a kind of attack in which the hacker, posing as a trusted individual, asks the user to open an email/message. This message is actually a malicious link which freezes the user's PC and fetches the sensitive information out of it. The theft might include the user's identity details, account details, stealing of funds, and other credentials as well. In order to combat these phishing attacks, you must focus on the email senders before you open an email or text message. Spear phishing comes in the form of an email which targets a particular individual in order to gain unauthorized access to their important information. This kind of hacks is not made by the hackers, but from a person you might be knowing, may be in the office or somewhere else who wants to gain your secret data. Some cybercriminals might carry out these attacks in order to resell confidential information to some private companies. Whaling phishing attacks are carried out simply to target high-profile employees like some CEO or CFO. Since these people hold the most sensitive information of the whole organization, hackers directly target them to get the data access. Unlike the standard phishing attacks, whaling phishing attacks are difficult to identify. Ransomware attacks enter in the form of malicious software which blocks the files and folders on your computer and makes them inaccessible. Whenever the user tries to view the files, the content is displayed in an encrypted form. To decrypt the data, the user is asked to pay a huge amount to the hacker. In fact, even after paying the complete amount, the users still don't receive the complete data. Trojan horse is a kind of malicious software program which seems like a regular software update which needs to be installed regularly. These are the most dangerous kind of malware which steals the sensitive information very smartly. Cross-site scripting is the most common type of hacking attempt where the hacker infects the web page with a malicious client-side script. As soon as the user opens this page, the script gets downloaded to the browser and executes thereafter. 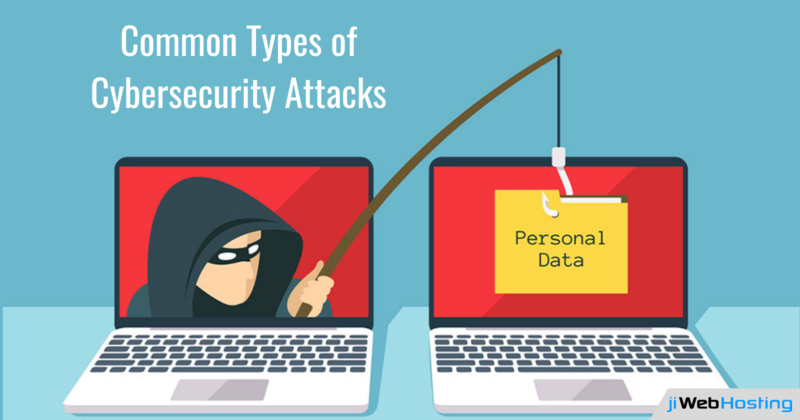 The above are the most common kind of cybersecurity attacks, there are many more data attacks which might harm your online process. So, if you are having your own website, you must carry out regular training sessions regarding website security tips and how to deal with them. Moreover, you can try some reliable web hosting provider which can monitor your website 24/7 and safeguard your website at all times. Have any queries or want to know more cybersecurity attacks, get in touch with us and get assistance from our experts.